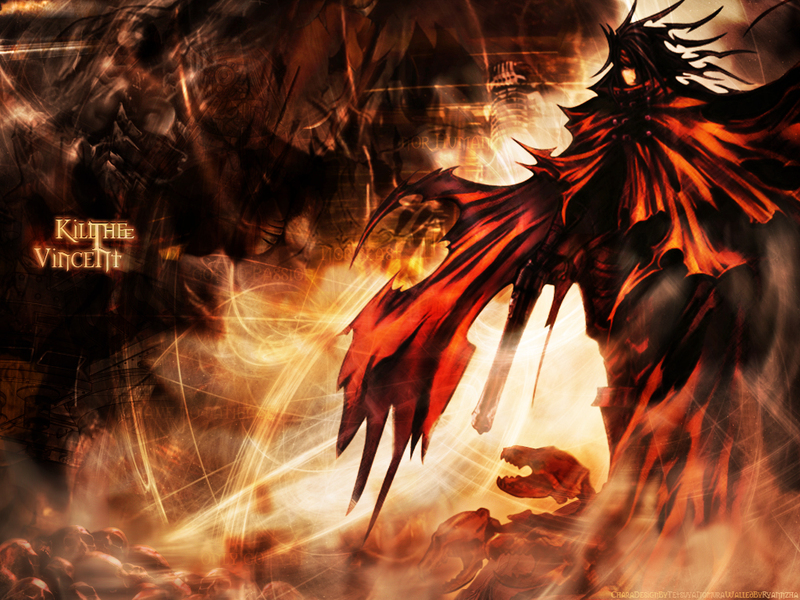 Final Fantasy VII: Dirge of Cerberus Wallpaper: Vincent : Kill Thee!! Minitokyo »	Final Fantasy VII: Dirge of Cerberus Wallpapers » Final Fantasy VII: Dirge of Cerberus Wallpaper: Vincent : Kill Thee!! Anotha humble wall of mine.. !! sorry 4 the title (lack of inspirationz) .. hope it's suitz yer imaginationz.. pwease 4 gimme 4 my limited skill.. i'll try better .. !! presentz Vincent 'cool' valentine..!! the coolest chara. in FF-seriez ever..!! my skill grown wit yer criticz.. so pwease.. gimme some .. 4 the sake of artz ..('n my improvement ofcorse) glad 2 hav u guyz as my frenz..!!..well.. enjoy!! This wall is awesome!! I havent seen a grat one like this in awhile! GJ!! wow, awesome wall, it just really nice! indeed! Wow. I mean...just...wow. I honestly just have no criticism for this wall. It's absolutely beautiful. The scan is blended wonderfully with the background, and they really complement each other. The abstract feel of the background really enhances the pic of Vincent. It all works great. Quote by Celessa...your skill has definitely incredibly improved over time. This is more a statement of fact rather than opinion. The way you chose to use the entire color spectrum of warm colors shows a diverse usage of complementary colors. This also anchors the character to the wall and doesn't make him feel like he's floating out of place. The placement of the character is very intelligent. You place him in a manner that has his cape flowing towards the center to keep the viewers eyes in the wall as well as guide them to the bright (but not too bright) and well texturized type. That "hot" yellow is a nice contrast to the darker reds and oranges. The multiple layers and textures only envelopes the audience even more so than his cape does him. Very nice wall that shows how much you're growing as an artist and designer. Definitly a fav! Wow, this one looks really nice. Great colors and neat effects. Great job! what the . *topples over chair* this is totally awesome! great work ryannzha . you're getting pretty good at this . I love the effects . They merge very well with the character.